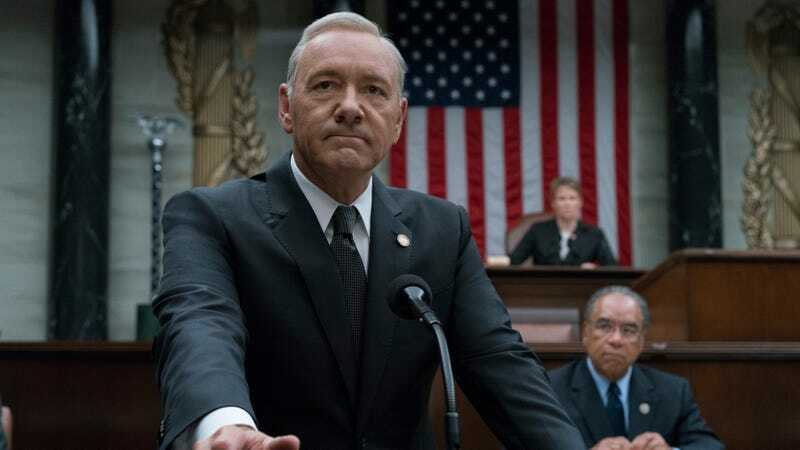 According to The Hollywood Reporter, Netflix has decided to cancel its old tentpole drama House Of Cards after a sixth and final season, finally putting Frank Underwood’s reign of terror (and outrageous accent) to an end. The Hollywood Reporter story initially suggested that the timing of this was essentially a coincidence, and that the decision to end the show had nothing to do with the recent allegation that House Of Cards star Kevin Spacey sexually harassed actor Anthony Rapp when he was 14, but Netflix has now released statement implying otherwise. As reported by Deadline, Netflix says that executives met with the cast and crew of House Of Cards today (Spacey isn’t filming at this time) to “ensure that they continue to feel safe and supported.” Netflix also said that it’s “deeply troubled” by the allegations, and though plans to end House Of Cards after its sixth season have supposedly been in the works since the summer, the decision to make this announcement now does seem to be related to the accusation against Spacey and the significant backlash he’s facing because of it—and because of his questionable response to it. No matter what’s happening behind the scenes, though, House Of Cards is coming back for one last 13-episode season at some point in 2018.